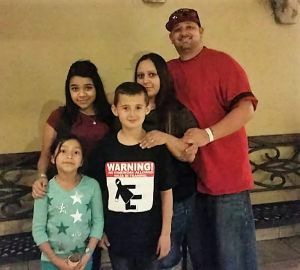 Donny, aged 40, was born in Indiana, grew up in Las Vegas, and moved to Phoenix in 1992. 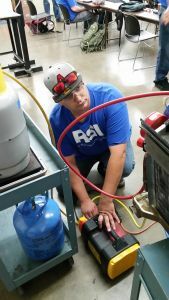 He graduated from the Electro-Mechanical Technologies program in July 2015, but first went into HVAC in 2007. 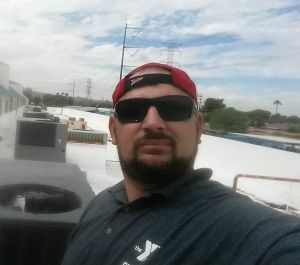 Thanks for your time Donny; what did you do before entering the HVAC field in your early 30s? Nothing really as a trade. My dad owned a bakery, so we had a family business for quite a few years. After that shut down I worked in the mortgage industry for a while. I used to set appointments for people to meet with mortgage brokers. Then in 2007 I got a scholarship from the DES to use at a community college to better myself – Vocational Rehabilitation is what they called it. Why did you choose the HVAC course? There was a choice of things to study; it was at a small community college in Cochise County. Because we’re in Arizona, air conditioning sounded like something I could make money doing. As well as the money, I also thought I’d be a good fit for the skills needed and for the kind of person I am. I passed the class and got certified. In 2008 I started as a technician and duct cleaner for a company. I did that for about a year, but I got tired of the way they did things. Their approach was mostly sales focused, and I didn’t want to do that. I wanted to fix stuff, not sell stuff. I interviewed at another air conditioning company but they only had an office job open; in the end I was there for five years. I always dreamed of being a technician again at some point; I knew that if I wasn’t using that knowledge I was losing it. What was it that made you go back to HVAC school at RSI? I was looking for a better education. When I was a technician I’d go to peoples’ houses and fix their units, but I didn’t have the terminology down like I needed. I couldn’t explain exactly what I’d done and why, in order to make the customer feel more comfortable about the repair. I started to feel a little insecure about the education I’d got because of that. I realized I didn’t have the depth of knowledge, and I didn’t like that. How did you discover RSI? I knew about their industry reputation and I’d seen the commercials of course. I set up an appointment, but it took me a couple of months to take a leap of faith, quit my job and focus all my energy on school. Do you feel that had you got an RSI education 8 years ago, you’d have found a better job back then? Yes I think I’d have been able to get a better job with a better company. Even though I’d been to school I was still pretty insecure about my abilities. After graduating RSI, I felt far more secure in my own knowledge. I learned lots of important things at RSI that were never mentioned at the other school. What was your favorite part of the RSI program, and why? I enjoyed Phase One – The Fundamentals of Electricity. The teacher for that phase, Dave Waddell, was wonderful; he gave us all the basics in such a way that it laid a great path for the rest of the program. He is high energy, his information is thorough, and he packs it all in to 20 days in the most wonderful way. There is nobody else for that job; the information that he passed into my brain completely stuck! I actually started in Phase Three – Fundamentals of Refrigeration – because of an overflow in the program when we joined, before going back to do Phase One. You graduated in July, where are you working and how did you get the job? 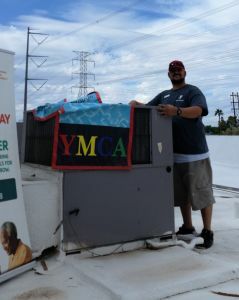 I’m the Maintenance Director at the Tempe YMCA. I started about 10 days after I graduated. I went to the RSI job fairs before I even started; that’s when I realized then that employers were out there looking for graduates. While I was at the school I also went to every job fair they held, even though I wasn’t looking for a job at that point. Towards the end of the program I got on the College Central network and posted my résumé and applied for jobs. That’s how I got the job at the YMCA… and my second job too actually. I also met with a company called Centerline Solutions; they cool the buildings that house the electrical equipment for cell phone towers. I met with them before the YMCA but they didn’t get back to me. But just in the last couple of weeks they offered me part-time work fixing those small units. I also do occasional side jobs helping a guy out with residential calls sometimes, so I kind of have three jobs! Are you happy with the money you’re earning? It is a perfect amount of money for me. For just starting again in the field really, it does everything I need it to do and a little bit more. I’m feeling well taken care of! I want to get a contractor’s license and I’d like to own my own air conditioning business. Did you leave RSI feeling more of a specialist in the field than when you went in? I feel like a true technician now. I can figure out anything that has to do with cooling and refrigeration. But not just that, motors as well. Here at the YMCA I work with the pools too; I’m a Certified Pool Operator. The motors on pool pumps are very similar to air conditioner motors. With my RSI experience, everything comes back to air conditioning! When I look at electrical circuits, I can relate to them. What’s your favorite aspect of working in HVAC? I enjoy the troubleshooting. I like that I can open up a system that’s not working and fix it. When I worked in residential, I used to enjoy peoples’ reactions once their system comes back on when they’ve been so hot. They look at you like you’re the smartest person in the world. There’s something amazing about that, it’s like they’re in awe! Especially on calls when someone else may have come out before you and not been able to fix it. If you’re the one who can get it to work, they love you! Did you make some lasting connections at the school? Four of us started in Phase Three; three of us completed the program. So I have two friends that went through all the classes with me; one of them is working for Chas Roberts now and the other, Michelle, went on to do the 15 month Mechanical Maintenance Engineering associate degree program. What advice would you give to prospective students considering attending RSI? Just listen and always read your book. If there’s a chapter to read, read it when you’re meant to because it makes a difference. I was one of those people who had to catch up on my reading quite a bit because I’m not much of a reader, so sometimes the lab part of the class was ahead of what I’d read. Read it when you’re supposed to, otherwise it’s easy to fall behind. I wanted a job where I could consistently maintain the same units in one building. That’s what I have here at the YMCA. I have 20 HVAC units that I maintain; I know this building and the units like the back of my hand. But dream job… For some reason I’d love to work in a hospital! I’d like to work on medical cooling systems; the refrigerators that keep blood cool, the HVAC systems and so on. I have two children, a nine year old boy and a seven year old girl, so most of my free time revolves around them and my girlfriend. Working at the YMCA gives me a lot of benefits with the kids; we play basketball, we swim, I can work out there. I’d buy a van, load it up with toys and take it to an orphanage. I’d love to see their faces! I’ve always said that’s what I’d do first if I ever won the lottery. Let’s finish with some quick fire questions? Pizza or wings? That’s a hard one…I’d say wings. Win the lottery or find a perfect job? Win the lottery!